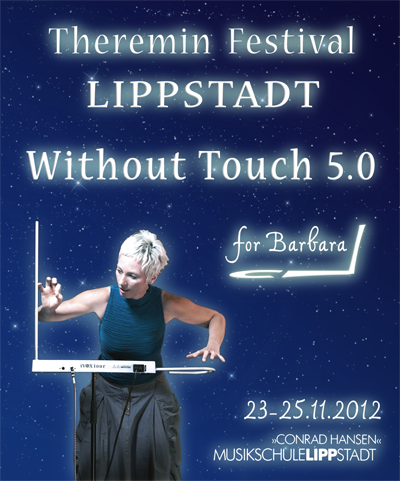 The registration for this year's Without Touch Theremin Festival from November 23 to 25 in Lippstadt/Germany is open! Without Touch 5.0 is dedicated to Barbara Buchholz. During the weekend you can participate in workshops, individual and group lessons, play in ensembles and upgrade or repair your theremin. It will be possible to sell or buy used instruments. The weekend ends with the concert “For you, Barbara” on Sunday, November 25, 2012 at 3 PM. You will hear music played by participants and teachers. Anna-Katariina Holmerus (voc.) und Alfred Kornemann (rezitation) will participate too. Another activity will be "Build a simple Theremin"
The participants will build a pitch-only theremin, based on the famous "Thierrymin" circuit, developed by Thierry Frenkel. The price for this workshop comprises a printed circuit board, all needed electronic components, a battery, a telescopic antenna, a nice enclosure and naturally building and tuning assistance. You will find the festival website here and the registration form here.